Location: Dunlop, East Ayrshire, Scotland. Condition: Restored and used as a residence. Notes: Aiket Castle itself was a four storeyed square tower typical of the residences of the lesser barons, originally surrounded by a moat and built by the Cunninghames soon after they acquired the land in 1479. 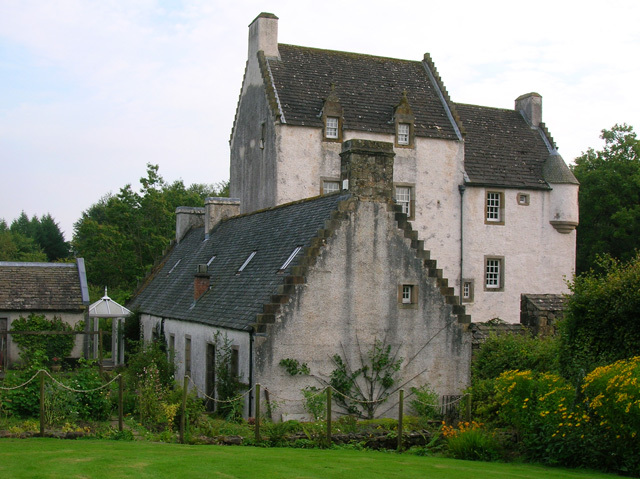 Following the murder of the 4th Earl of Eglinton the castle was destroyed and then rebuilt, with an extension, in 1592. In 1734 the castle was sold and the new owners attempted to remodel the castle as a Georgian semi-classical mansion, removing the top storey in the process. The Dunlop family owned the building in the start of the 17th century and latterly it was used to house farm labourers. In 1957 the building was gutted by fire and was then restored to its pre-1734 condition by the present owners (2010). The restoration was awarded a Diploma of Merit by Europa Nostra in 1987. The placename 'Aiket' is derived from 'Oak Wood'. Barr Hill, near Aiket Castle (Ackett in 1775) had two interesting small monuments on its top until the early 19th century. These structures were well built, with lime cemented stones and stood twelve feet high. Typically for feudal baronies, Aiket possessed a Justice Hill for the open air meeting of the barony court; as indicated on OS maps, this stood close to the castle. Commentary & video on 'The History of Aiket Castle'.